Right after my regular checkup at Parañaque Doctor's Hospital yesterday, I went to SM Bicutan to buy a few thing for the baby. And because I didn't get a chance to go to the Baby Company's Grand Baby Fair, I thought this is a bright idea for me to get a Baby Company's Mom Card that I've been wanting all this time. Hitting 3 birds with a stone! First, I purchased some stuff for the baby that totaled around Php500. From that single receipt, I finally got my own Mom Card. To which I eventually use to have a 10% off on Owen Pillows, as they're on a special discount from January-February. Not bad huh?! 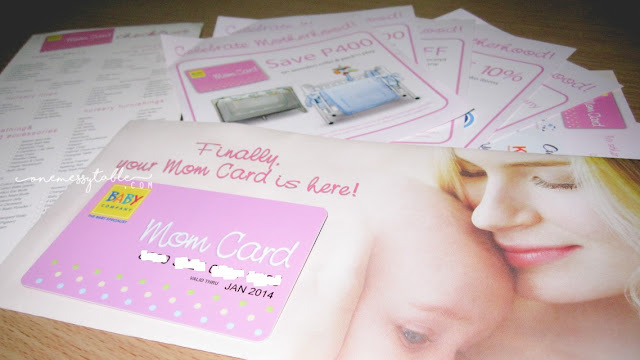 Now that I have my Mom Card, I will (and must!) go to the next year's Grand Baby Fair!